A young guard has sat down to fetch his breath after a clash of arms. He is wounded but the wound is not lethal. Which side of the door is he going to choose when his strength is restored. loneliness, shelter, refuge, solitude, exile, retreat, healing, recre- ation. Reversed: adventurous actions, anxiety and stress, lack of confidence, a conflict. 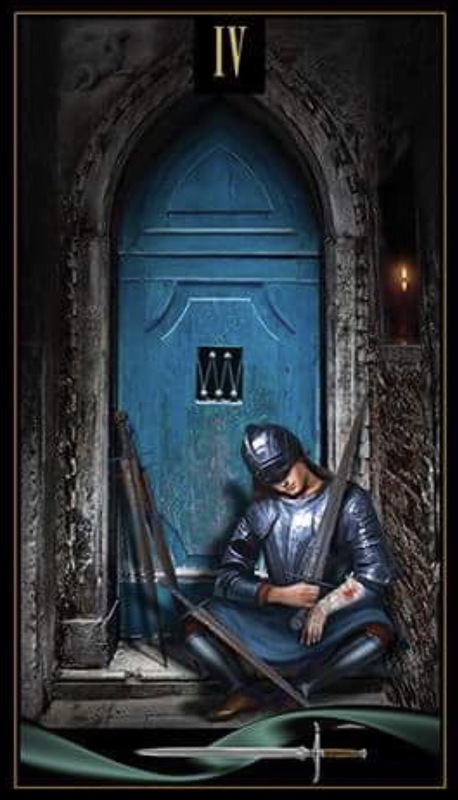 This entry was posted in Artist, Deck Review, Featured Card of the Day, General Tarot, Readings and tagged 4 of Swords, Eugene Vinitski, Tarot, Venetian.